After hearing emotional testimony from Newtown families who spoke movingly about the mass shooting at Sandy Hook Elementary School, lawmakers from both sides of the aisle voted to begin the process of debating a gun bill. NBC's Kelly O'Donnell reports. A new gun control law cleared a major Senate hurdle Thursday, with 16 Republicans voting with most of the chamber’s Democrats to begin the process of moving one of President Barack Obama’s top domestic initiatives through a long, legislative slog. Senators voted 68 to 31, with a handful of Republicans joining most Democrats, on a procedural measure to begin consideration of a proposed gun law that would expand background checks for gun sales, and strengthen mental health and school safety programs. The vote is just the opening step, though, of a debate that could stretch out for weeks and encounter any number of obstacles – namely, the Republican-controlled House of Representatives – before reaching Obama’s desk. 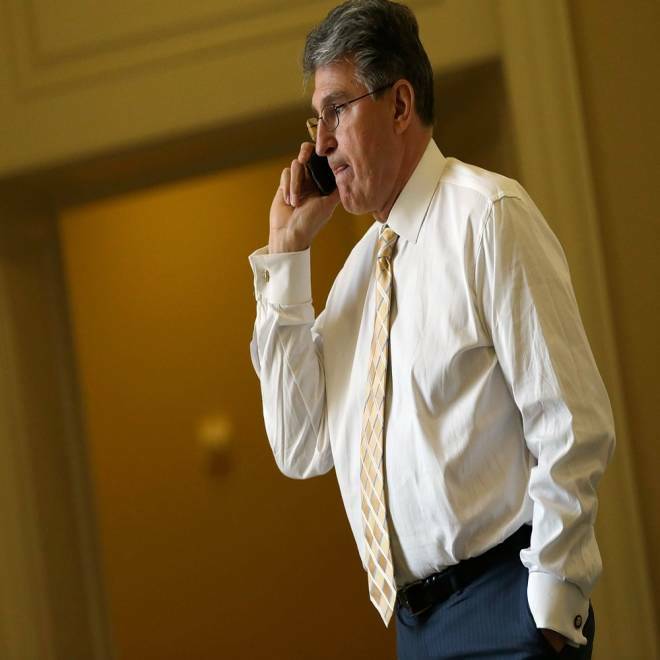 Thursday’s vote comes on the heels of a bipartisan Senate agreement on Wednesday on expanding background checks, the centerpiece of gun control advocates’ effort to strengthen rules on firearms following the December 2012 shooting at an elementary school in Newtown, Conn.
Sen. Joe Manchin speaks on the phone outside the weekly Democratic policy luncheon on April 9 in Washington. While their accord prompted renewed hope of bipartisan action to advance new gun laws for the first time in years, their proposal (along with several other gun measures slated for consideration by Congress) still face stiff resistance from conservative Republicans and the influential gun rights lobby, the National Rifle Association. The NRA released a letter late Wednesday saying it was “unequivocally opposed” to the new gun rules, including the Manchin-Toomey proposal. Their declaration may weigh heavily on lawmakers seeking the NRA’s support – or, at the very least, avoid being targeted by the group – in their re-election efforts next fall. “Given the importance of these issues, votes on all anti-gun amendments or proposals will be considered in NRA’s future candidate evaluations,” wrote their chief lobbyist, Christopher W. Cox, in a letter to members of Congress. And a group of Republican senators have vowed to slow down the legislation by offering a multitude of amendments to the gun legislation, and exhausting the hours of debate to which they are entitled for each amendment. Those conservative lawmakers are backed by Senate Minority Leader Mitch McConnell, R-Ky., who voted Thursday against even beginning formal debate on gun legislation. "The senators who have vowed to filibuster this bill should be ashamed of their attempt to silence efforts to prevent the next American tragedy," said 33 family members of Newtown victims in a joint statement. "Their staunch opposition to sensible gun reform is an affront to the 26 innocent children and educators who were murdered in Newtown." The Senate bill could also be undone by so-called “poison pill” amendments which Republicans could attach with the help of a few swing-state Democrats, but risk making the whole bill unacceptable to most other Democratic senators. Sen. Charles Schumer, D-N.Y., highlighted a provision that would require states to recognize concealed carry permits from other states as an example of one such poison pill. Nonetheless, the coming Senate debate will provide an exercise in posturing – both on the central proposal dealing with background checks, but also additional measures that are all but certain to fail, like a proposed renewal of the ban on assault weapons, and a ban on high-capacity magazine clips. The debate will play out as new poll data showed that a majority of Americans generally favor stricter gun laws. A new NBC News/Wall Street Journal poll released Thursday found that 55 percent of Americans favor gun laws, versus 34 percent who prefer to keep the laws as they are now. Nine percent of Americans prefer less strict gun laws. Pia Carusone, Executive Director of Americans for Responsible Solutions, says they support a new background checks bill put forth by Sen. Pat Toomey and Sen. Joe Manchin. The popularity of these proposals has been a key point of emphasis in the administration’s demand that these measures receive a vote in Congress. But even if these proposals were to successfully emerge from the Senate, gun legislation faces an uncertain future in the House, where Speaker John Boehner, R-Ohio, has not pledged to bring up any Senate-passed bill for a vote. “I think it's important for the Senate to do its work, and once they do their work we'll be happy to review it,” he said Wednesday on Capitol Hill. At the same time, though, a bipartisan pair of House members is working on legislation which will mirror the Manchin-Toomey proposal, in hopes of winning organic support for this legislation in the House.